The operator of the Channel Tunnel says it's prepared for the worst case No Deal Brexit and that the "large majority" of traffic will be able to pass straight through border checks. 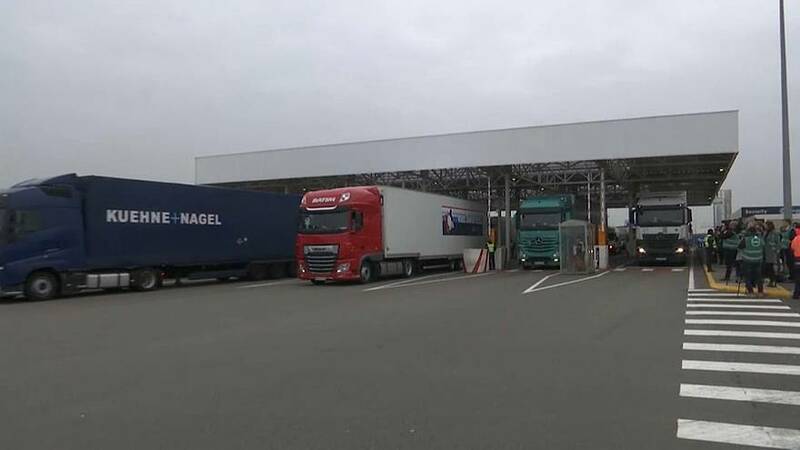 Eurotunnel said that truckers will be obliged to fill in customs forms in advance of leaving the UK so the authorities can be pre-notified of which vehicles require additional checks. Because traffic is already subjected to security and immigration control, the additional steps can be conducted at the same time. "This is to make sure that traffic continues to flow smoothly through the Channel Tunnel regardless of the Brexit status that we get. So in the event of a no-deal, we've prepared for the worst case no-deal," said John Keefe, EuroTunnel director of Public Affairs. "So as they arrive into France, in Coquelles, they will go past a sign which directs them either to continue straight to the motorway along the green line or to go into the control zone along the orange line. And that way, we separate the straight through, the large majority of traffic which will go straight through from the small percentage which will need to be controlled on arrival." Keefe said EuroTunnel had spent €15 million on extra infrastructure and preparations since Brexit was announced.